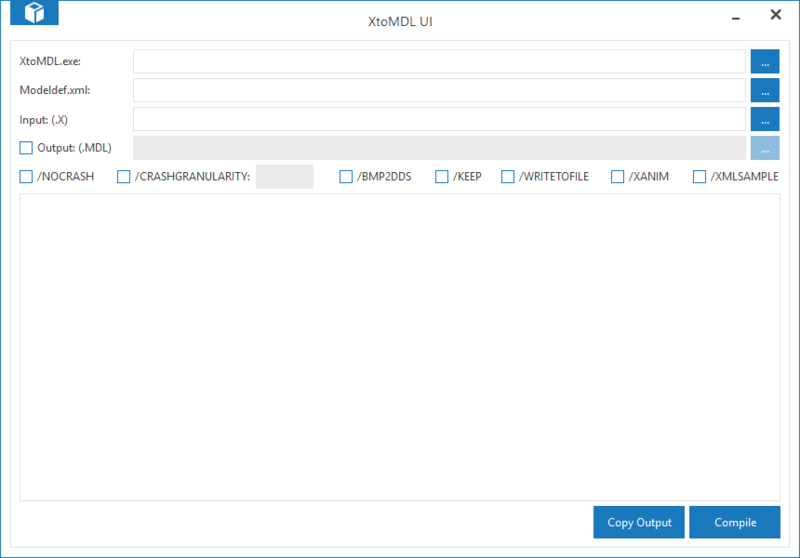 XtoMDL UI is an intuitive application for compiling FSX/P3D model files (.mdl) with XtoMDL.exe. This is the first program that I've released publicly, so feedback (and/or reports of any issues) is appreciated! Note: The output checkbox is optional. If not selected, the model will compile to the same location as the .X file. If checked, you can specify a different location and file name for the .MDL. .NET Framework 4.5.1 is required to run this application. This software may not be decompiled, modified, or sold in any way. The author holds no responsibility for any damage this software may cause to your computer and/or files. By downloading this application, you agree to these terms. This software may be used to compile models for both non-profit and commercial projects. Very decent of you Brandon, should smooth the development path for many! Brandon, that's really useful thanks, seems to work fine in Win 7! Is it possible to add the /CRASHGRANULARITY flag with an entry field for the resolution? The default is normally okay but if I'm compiling an aviation capable ship it's handy to drop it down to 1 meter so there's less chance of having a crash on deck! Thank you Brandon, much appreciated. Good to know that it's working on Windows 7. I never even knew about the /CRASHGRANULARITY flag (neither the SDK or XtoMDL listed it as an available flag). I'll look into adding this. Should be real easy to do. Are there any other hidden flags? I never even knew about the /CRASHGRANULARITY flag (neither the SDK or XtoMDL listed it as an available flag). I'll look into adding this. Should be real easy to do. Are there any other hidden flags? Great work, Brandon. The FSX SDK is certainly lacking UI's for a lot of tools, so this is a great help. Thanks Bill. I'll have to take a look at what the official FSX and P3D XtoMDL supports, as well as if his version lists the flags anywhere. And thanks, Cory! Command line programs and bat files can be great, but sometimes repetitive tasks (or those that require lots of information to be specified) can definitely be aided by user interfaces! Next time the application is launched, an update dialog should be displayed. As well, anyone using this, please let me know if the update goes smoothly. I've only tested it on my system. That seemed to go smoothly enough on my system, tried out the new options and they're working fine as well. I actually only use(d) Sean's XToMDL.exe for the FSX SDK and P3Dv1 SDK, and even then only using the command line parameters, via SendTo shortcuts. Given that I only export/compile aircraft models, the "agnostic" shortcuts require no changes. This is just a small update to replace the current settings reading/writing system with a custom system. From now on, future updates should not clear your settings (this is the last update where you will need to configure your settings again). The major new feature in this build is the addition of the /WRITETOFILE flag as a checkbox. Currently, the checkbox is enabled regardless of your selected XtoMDL.exe. Unfortunately, due to the fact that Lockheed Martin has not incremented the version number of XtoMDL.exe with each update, I have no reliable way of detecting whether a supported executable is selected. In theory, I could use the SHA1 hash of the file, but I'd prefer to not have to update my tool every time the SDK is updated. Since most people probably don't use the SDK without patch 1.4.6787.0, I might just check if the FSX XtoMDL.exe is selected and disable the checkbox based on that. If anyone has any thoughts on this, feel free to comment. One thing I noticed while using this flag via a command prompt is that if the XML file from the previous compilation was still there, the model would fail to compile. I've not had this happen since implementing the flag into my tool. Again, if anyone has any comments/experience with this flag, feedback would be appreciated. Impressive, Brandon! I didnt know you were into programming. I must check this out. Thanks! I'm no expert, but I've learned a bit of C# in my free time over the past few years. i still using SendTo Shortcut till now. is there any different mdl if using Sean's XToMDL.exe or this Xtomdl UI ??? I don't believe the output is any different with Sean's (otherwise FSX wouldn't be able to read the models, most likely). His is a custom 64 bit version of XtoMDL.exe itself. My tool is just a user interface that will send commands to the XtoMDL.exe included with the FSX SDK. Thank you Brandon. This could simplify the export process. I write batch files for my exports and have to make copies with little edit changes for each model. I have been testing XtoMDLUI this morning. I use Max 2015 and both the P3D v1.4 and v2.5 SDKs on Windows 7 Pro 64. 1. Compiling through v2.5 works fine. 2. Compiling through v1.4 crashes XtoMDLUI. Using my batch file to double check for errors on my end the model compiled properly. I checked and rechecked my paths and made several attempts but all ended with a crash at the start of compilation. I used the download XtoMDLUI v1.0.3.0 at the top of the thread but I don't know if this version has all the updates. 1. Allow input for compilation of both exterior and interior models in one session. 2. I noticed that you can have multiple copies running but each retain the same paths. It would be nice but not necessary if we could have copies renamed (XtoMDLUI-P3D) and say (XtoMDLUI-FSX) that retain their own independent paths. You keep up the good work and I'll keep testing. A simplified interface and time saver like this is something I would be willing to pay for and it sure would make it easier for the newbies.